WHITE SANDS MISSILE RANGE, New Mexico — The start of the annual Bataan Memorial Death March is a raucous affair. The sound of cannon fire sends 7,000 hard-charging and motivated athletes surging across the starting line into the New Mexican desert under a vibrant orange and violet sunrise. They whoop and cheer as they embark on one of the most grueling sporting events in America. Their ranks include wounded warriors, active duty service members, veterans, professional athletes — and last year even a team of circus performers. A large crowd of onlookers tirelessly cheers them on. The cannons fire again and again. As the footsteps of the last starter recede into the distance, a final participant unlike all the others slowly approaches the line in the settling dust. Wearing comfortable dress shoes, slacks and a button-up dress shirt under his bright orange Clemson University windbreaker, he always receives the loudest cheers of all. This is retired U.S. Army Col. Ben Skardon, the only survivor of the real Bataan Death March during World War II who walks in the event. On Sunday, March 19, he will walk in the march for the 10th time, just four months short of his 100th birthday. He aims to walk eight and a half miles. Skardon is an alumnus of Clemson University, which he attended as a cadet from 1935 to 1938 when it was an all-male military school. He returned to Clemson after the war and became an English professor, was named an Alumni Master Teacher in 1977 and taught until his retirement in 1985. It was just another beginning for him. 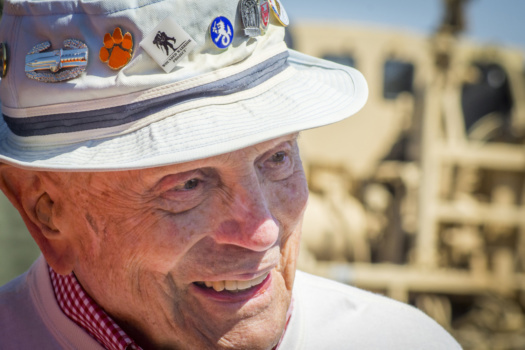 It would be 22 years before he made the pilgrimage from his home in Clemson to White Sands Missile Range to attend his first memorial march in 2007. At that event, he spontaneously decided he didn’t want to just sit and watch with the other honored survivors — he wanted to walk. So he waited until the last participant was off and running and he started walking, just to see how far he could go. The rest is history. Retired U.S. Army Col. Ben Skardon, 98 (in white shirt), walks with “Ben’s Brigade”, a group of his supporters, in the 2016 Bataan Memorial Death March. He walks — methodically and as steady as a desert tortoise — across the desolate, sandy terrain to honor his brothers-in-arms who did not return home from the war. It is the continuation of a journey that began 74 years ago in the dank jungles of the Philippines. The story of the Bataan Death March began April 9, 1942, when about 75,000 Filipino and U.S. soldiers were surrendered to Japanese forces. The infamous 50-80 mile march was characterized by wide-ranging physical abuse and murder. It resulted in death inflicted upon prisoners and civilians alike by the Japanese Army and was later judged by an Allied military commission to be a war crime. Mostly forgotten is the four months of fierce fighting that preceded it. Battles began immediately after the bombing of Pearl Harbor and were fought in a region plagued by malaria. Allied forces were hampered by outdated equipment and nearly no air power. They survived on quarter rations and received no medical help. Skardon begins a more than eight-mile walk in the Bataan Memorial Death March of 2016. In that short timespan, Skardon, a newly minted captain, led Company A of the 92nd Infantry Regiment PA (Philippine Army), a battalion of Filipino Army recruits on the Bataan Peninsula. He earned two Silver Stars and four Bronze Stars for valor. When the Allied forces finally had to surrender, things turned from bad to worse for Skardon and his comrades. Three quarters of a century later, he still vividly recalls what it was like. They were forced to march approximately 60 miles north to Camp O’Donnell, a prison camp, in the scorching heat through the Philippine jungles. Between 5,000 and 11,000 did not survive. Those that did were rewarded with years of horror in Japanese prison camps until they were either rescued or died. Skardon wears comfortable dress shoes, slacks. a button-up dress shirt and an orange Clemson wind breaker for the march. Skardon survived for more than three years in the camps, despite becoming deathly ill with malaria, beriberi, diarrhea and other ailments. Two fellow Clemson alumni, Henry Leitner and Otis Morgan, kept him alive by spoon-feeding him and eventually trading his gold Clemson ring — which he had managed to keep hidden — for food. Incredibly, Skardon also survived the sinking of two unmarked Japanese transport ships carrying him and other POWs to mainland Japan, including the infamous sinking of the Oryoku Maru. Morgan was killed during the bombing of that ship and Leitner died in a POW camp in 1945. Skardon eventually ended up in a prison camp in Manchuria, where Russian units freed him in August 1945. He was 24 years old and weighed 90 pounds. Remarkably, his service to the United States did not end there. He served in Korea in 1951-52, and retired from the Army with the rank of colonel in 1962. Skardon and a few of his supporters display their Clemson University class rings at the eight-mile marker of the Bataan Memorial Death March March 20, 2016. Back on the hot and dusty plains of White Sands, Skardon is greeted by enthusiastic groups of admirers at every checkpoint. His pace is hard to believe for a man approaching life’s century milestone — every 30 minutes he covers another mile. “I have so much respect, admiration and love for this man,” said Cheryl Fallstead, a New Mexico writer and editor and proud member of Ben’s Brigade, the loyal group of supporters who walk with him every year. It includes many of his former students and Clemson alumni. The 25 members of Ben’s Brigade take turns holding him steady and keeping his spirits high by cracking jokes and singing the Clemson fight song. After about two miles the route veers off of pavement and onto a dirt road that cuts straight through the sand and creosote-covered plains for several miles. It’s on this stretch that the group settles down a bit and Skardon becomes quiet. Skardon walked the 8.5 miles in his best time ever last year: 4 hours, 2 minutes. Retired U.S. Army Col. Ben Skardon, a survivor of the Bataan Death March, crosses his own personal finish line after walking 8.5 miles in the Bataan Memorial Death March at White Sands Missile Range in New Mexico on March 20, 2016. Skardon says that as long as he’s able, he will keep making his pilgrimage to the desert each year. It’s his sacred responsibility. How many more years he’ll be able to do it is anybody’s guess. “I’m not going for anything except as far as I can,” he said. May God Bless Him and be with him on that march. My uncle was also on that original march and he too did not let the unimaginable things that happened to him or that he endured ruin his life or his love of America. He is often in my thoughts, especially now that so many young, (and many not-so-young), adults have so little self respect or respect for our country. These wonderful men have a special place in Heaven! May God Bless and take special care of Retired U.S. Army Col. Ben Skardon and all of the survivors, and a special prayer for those who again are walking in memory of their own survival of that horrible march and the survival and loss of their brothers in arms.